Knit these dishcloths out of organic cotton for your Independence Day BBQ! US 7 Needles suggested, not included. The pattern is free on our website. 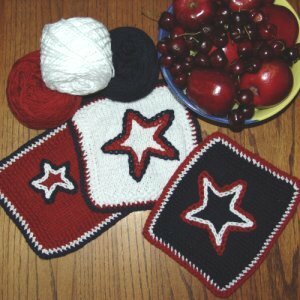 The kit will make 2 white dishcloths, 2 red, and 2 blue! $43.80 -- Kit price including yarn only (no book or pattern). If you like the Blue Sky Fibers Worsted Cotton July 4th Dishcloths kit, then you may be interested in some other kits covered in our 4th of July collection.